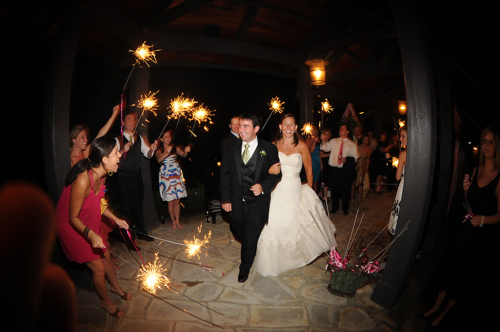 Sikky from Rogers & Gala Creative Partners Inc sent us this incredible North Carolina wedding…. Prepare to be insanely amazed. 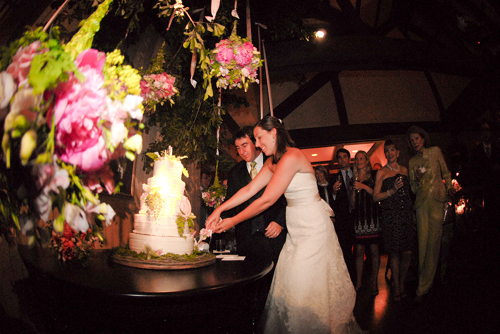 Amanda and Adam were married on June 21st 2008. Like most of us, Amanda had pictured her wedding ever since she was a little girl. And it was always outdoors. 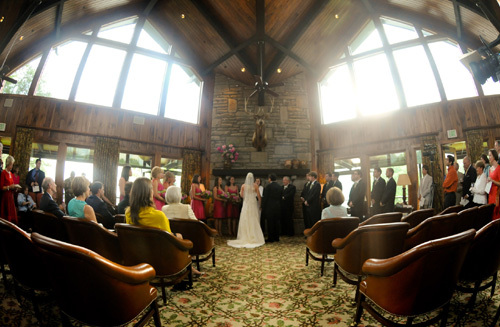 The sun had been shining for two weeks before the wedding in the beautiful Blue Ridge Mountains. 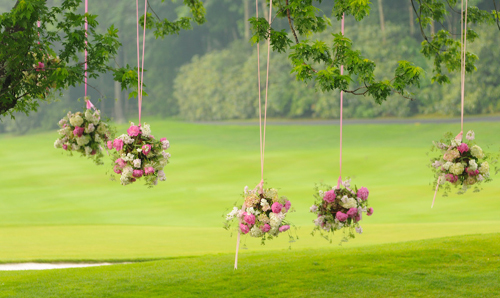 It was a calm and delightful day for an outdoor wedding. 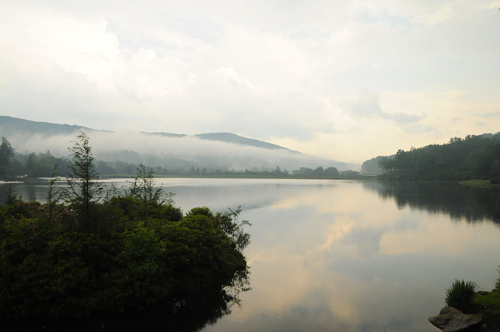 Picture perfect until… one drop of rain, two drops of rain, three, four, five… and then the sky opened up. There was a rain plan but the bride said: “Let’s wait just a little bit to see if the rain will disappear.” The wedding director was running back and forth from the island to the beach house with her raincoat and rain boots on, trying to figure out a plan. 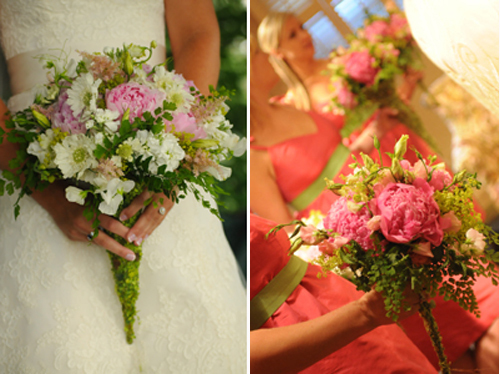 The bride started crying, and crying and crying, her tears mirroring the conditions outside. She wanted to get married on the island, but the rain just wouldn’t stop and the bride just wouldn’t give in. They went from plan A, on the island, to plan B in the beach house, to plan C in the clubhouse, back to plan A then plan B and finally settled on plan C at the bar inside. …The only problem was that plan C was never an option. Ceremonies and private functions in the bar were not permitted. The bride dried her tears, and the ceremony turned out to be beautiful with the lord of the forest, a moose, looking down over the couple as they wed. The guests, who were none the wiser, had been drinking the signature drinks – Raspberry Lemonade with vodka with a slice of lime – and eating the hors d’oeuvres for the cocktail party while the bride was melting down, so they were ready to party. 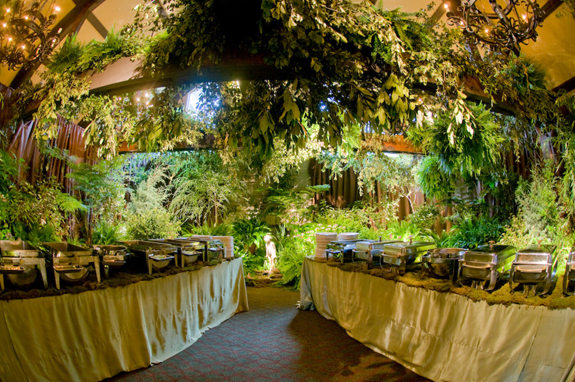 Guests gasped as they looked upon the room filled with trees and shrubs, rafters and walls dripping with smilax garland, buffet tables covered in moss and over 100 Kimberly Queen, Boston, Fox Tail and Australian Tree Ferns. 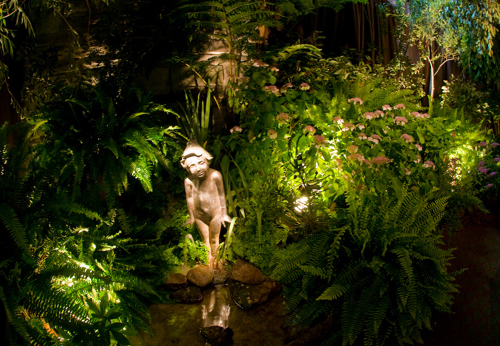 At the center of it all was a Bronze Pan Statue Fountain in a pool of water with maidenhair ferns. As an added bonus, some crickets took a ride in on the ferns and stayed to serenade the guests (along with some bird sounds from a hidden boombox). This room was a sanctuary. After dinner everyone got pumped when the event planners started handing out lottery tickets. The band kicked in with the “Money Song” Amanda’s brother got on stage and spoke: “Amanda and Adam are obviously passionate about each other, but you may not know they have two other passions. Amanda, being a teacher is obviously passionate about education and Adam is passionate about Scratch off Lottery Tickets. You are about to receive a favor that will feed both of these passions and, if you are lucky, your very own wallet. 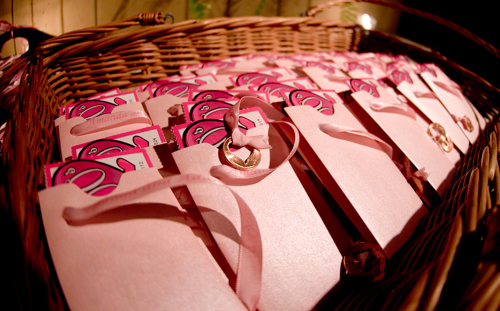 There is one envelope with two lottery tickets inside for each guest. The band, “Ride On” made it so that the dance floor was never empty. They only took one break to re-energize for another round of fun, and during that time the bride and groom cut their four layer, double stacked Genoise cake with custard filling. When the clock struck 9,the Grotto doors were opened once again and the room had been transformed into an iced martini bar and a candy bar. 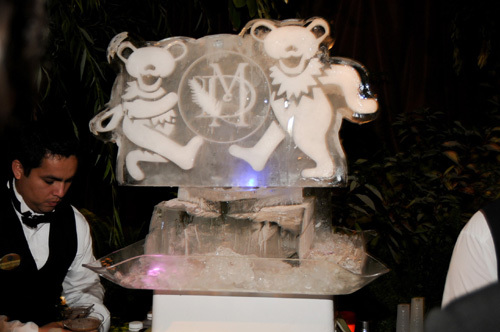 The martini bar consisted of two large dancing bears that stood behind the bar, and two blocks of ice shaped like a mountain with Amanda and Adam’s monogram on each one. 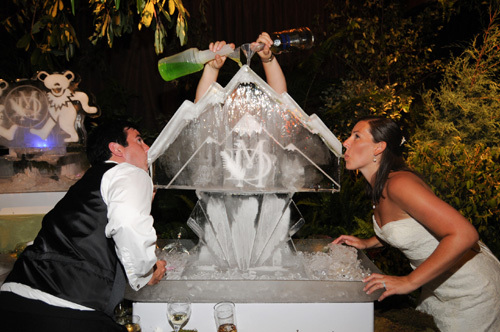 There was an ice luge on either side of the mountain for chilled Chocolate Martinis, regular Martinis, green apple martinis and cosmopolitans. 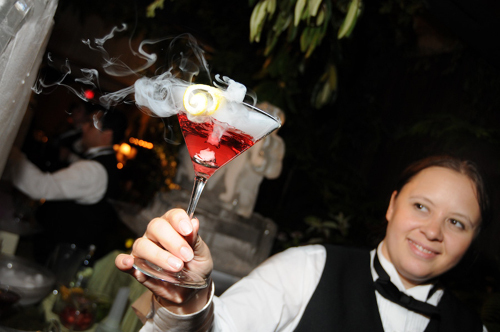 The dry ice in each had all the guests squealing with delight. Opposite the bar, a candy display had been set out. 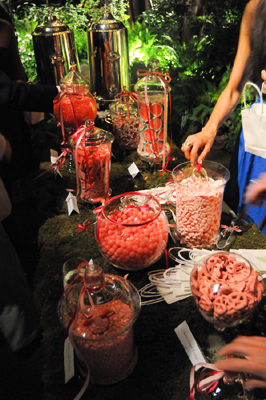 Tiny pink candy hearts, Pink Jelly Bellies, pink sour power, strawberry belts, pink pillow mints, sour lemonade gum balls, Dahlua French, Chamborde Praline, peanut butter, and milk chocolate truffles were all displayed in clear containers and presented on an 8 foot serpentine table covered in moss. 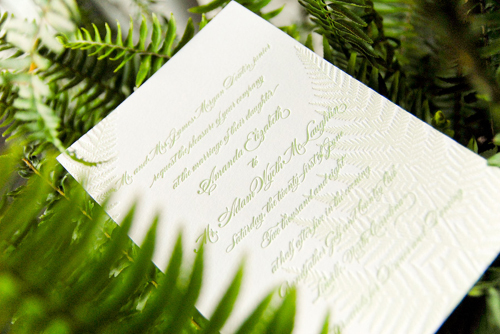 The guests were given white bags with a fern on the front to fill and take home for an evening of sweet memories. Throughout the whole evening, the band kept the momentum going. Near the end of the reception, the guests begged them to keep playing and they obliged. After exhausting every idea to get the bride and groom on their way, the event planners asked the band to be pied pipers and get everyone in a line and lead them outside. As the evening drew to a close, the happy couple drove off into the night, their guests slowly filtered away…and it had finally stopped raining. 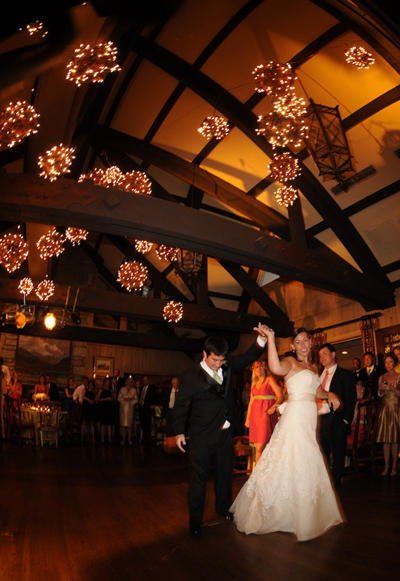 The stars were shining down on the newlyweds through the clear, crisp night as a blessing from above. 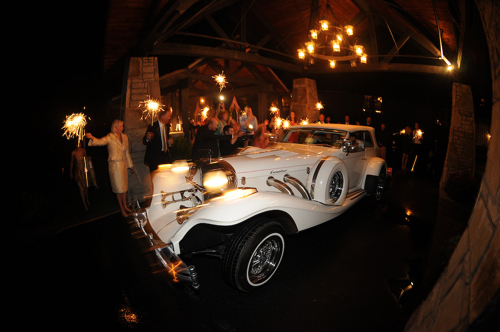 About: Rogers and Gala Creative Partners, Inc. is a full service event planning and design firm. 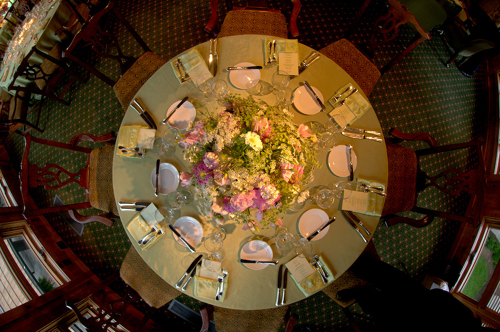 We produce events and weddings that send a clear message to your guests whether it is corporate or social. From conception to completion, our goal is to create experiences that inspire. With meticulous attention to detail, we will bring your vision to life.Our gift is innovation. Our passion is design. Our promise is perfection. Let us inspire you. beautiful! i hope she lists her dress on this site,lol. it’s gorgeous! 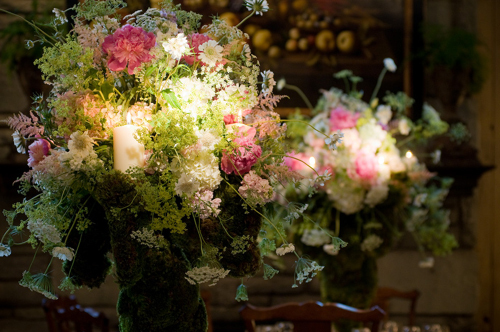 Beautiful wedding, but I cannot imagine how costly it was. Geesh, must have been over $100K at least. You guys did an awesome job Sikky! It looked awesome!